where the well known Corona Beer Commercials are filmed. This is one of only a handful of newer, and smaller (under 40 units) luxury condo complexes actually located on the beach in Playa Del Carmen. Our two bedroom condo, is a beautifully decorated ground floor unit with a large patio adjacent to the gorgeous pool and garden area. From our comfortable and private patio, complete with an elaborate and soothing waterfall feature, you will have direct access to the pool. With two bedrooms, extra air mattress and a large comfy couch in the living area, this unit sleeps four to six very comfortably. This is a very quiet complex, so you'll experience a much more relaxing vacation here than if you rent in the 100 unit+ complexes in Playacar. Also, it is located on the northern end of Playa Del Carmen, bordering jungle to the north so auto traffic is non existent. There is secure parking available if you rent a car and most Playa attractions, including 5th Ave. with it's many exciting shops and wonderful restaurants, are just a short 5-10 minute walk. We recently added dedicated high speed wi-fi internet access in the condo. In my professional life, I work in the sports industry as a TV producer and sports technologist. I have been visiting the Playa Del Carmen area for 20 years and have an immense amount of knowledge about the area that I will share with you. 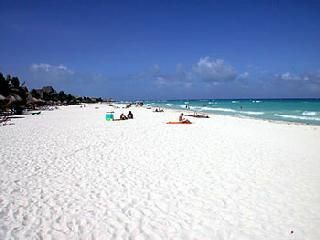 This is considered the nicest complex on the beach in Playa Del Carmen. It's also the lowest density development in the entire city so there is plenty of privacy and beautiful lush gardens. Plus, you're right in the middle of all the best Playa has to offer. Awesome location! Private terrace, rooftop terrace with stunning ocean views, large pool area and waterfall features throughout the property. Full kitchen with stove, oven all cookware, utencils, dishware, etc.